White Oil or Heavy Liquid Paraffin Oil, Light Liquid Paraffin Oil, Technical Oil, Transformer Oil, Petroleum Jelly or Petrolatum for cosmetics and pharmaceuticals, Cable Jelly, products for engineering, products for textile industries like antistatic coning oil, various waxes or any of the various industries consuming them, then you have come to the RIGHT SITE ! Paraffin oils are very versatile petroleum products which are being used in numerous industries ranging from food to engineering. On this site we have tried to provide you all the necessary information about our company and products. 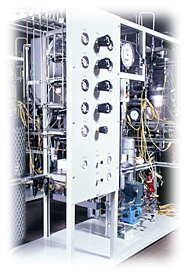 We also supply products for inks and resin industry (technical oil) and supply petroleum jelly in consumer packs. Other than the products mentioned here, if you require any other product tailor-made to your specifications, then please feel free to contact us, we will be glad to assist you. 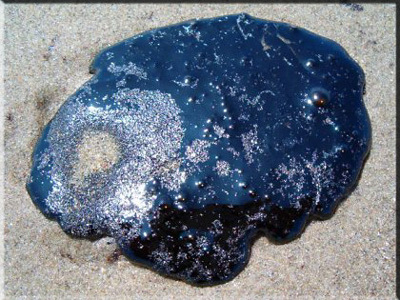 Crude Oil Blob, source of mineral oil, white oil, petroleum jelly etc. During the past 600 million years incompletely decayed plant and animal remains have become buried under thick layers of rock. It is believed that petroleum consists of the remains of these organisms but it is the small microscopic plankton organism remains that are largely responsible for the relatively high organic carbon content of fine-grained sediments like the Chattanooga shale which are the principle source rocks for petroleum. Among the leading producers of petroleum are Saudi Arabia, Russia, the United States (chiefly Texas, California, Louisiana, Alaska, Oklahoma, and Kansas), Iran, China, Norway, Mexico, Venezuela, Iraq, Great Britain, the United Arab Emirates, Nigeria, and Kuwait. The largest known reserves are in the Middle East.